Pressure Cooker Dirty Water Hotdogs are reminiscent of all those fabulous pushcart street Hot Dog vendors in New York City. Close your eyes and imagine standing on the curb, eating a hotdog from a vendor in Times Square. The vendors, with their Sabrett umbrellas continue to add new hotdogs to the water in their carts, without changing the water. I have no idea if the water ever gets changed at all, but for now, I’m not going to think about that. Do those Hotdog Buns look soft and fluffy to you? Yeah, well then, for those wondering what to do with your whey from your Homemade Greek or Regular Yogurt, check out my Japanese Hokkaido Milk Hotdog Buns recipe! I made those yummy looking buns myself. No commercial yeast. 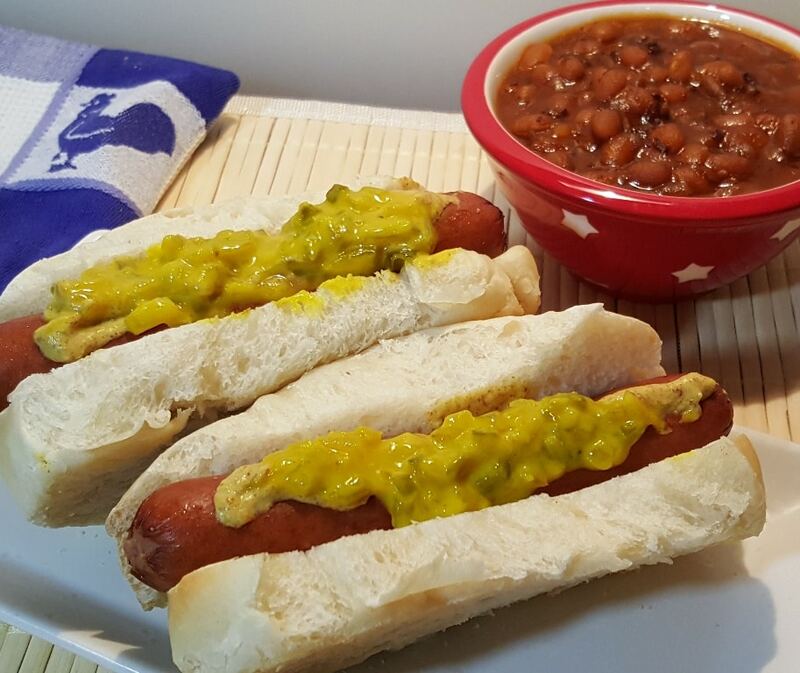 Thanks to my FB friend Perry Younker, for sharing this recipe for Mario Batali Dirty Water Hotdogs. I was inspired by him when he posted the recipe to convert it for the Instant Pot Pressure Cooker. My hubs, who is from New York says, you can’t make Dirty Water Hotdogs using fresh water. Well, yeah, but, I can sure try. I imagine that this recipe tries to replicate the “dirty water” in the vendors’ carts. I imagine the long soaking of the hot dogs in those carts release some cumin and nutmeg in to the water. I would also imagine, that the vinegar gives the water some history, longevity if you will….at least that is what I would imagine. While the street vendors use Sabrett hot dogs, my favorite dogs are now the Kayam brand. They are all beef and have a casing. Those dogs are incredible. They have that wonderful snap and burst of juice! I suppose Sabrett or Hebrew National will have to do for now. Make sure to buy Hotdogs that are NOT skinless. Unfortunately, I cannot find anything remotely similar here in Los Angeles. If any of you know of a good hotdog, please let me know. As you can see, there is room to make a lot of Pressure Cooker Dirty Water Hotdogs in my 6 Quart Instant Pot Pressure Cooker. If you want to make a larger amount, just double or triple the recipe. I imagine you could feed a whole stadium using this new 14 Quart Pressure Cooker. Oh my, that sure is a big one! For six hotdogs, just give the Nutmeg a couple of passes over the Microplane. That should be enough. If you double the recipe, double the spices. 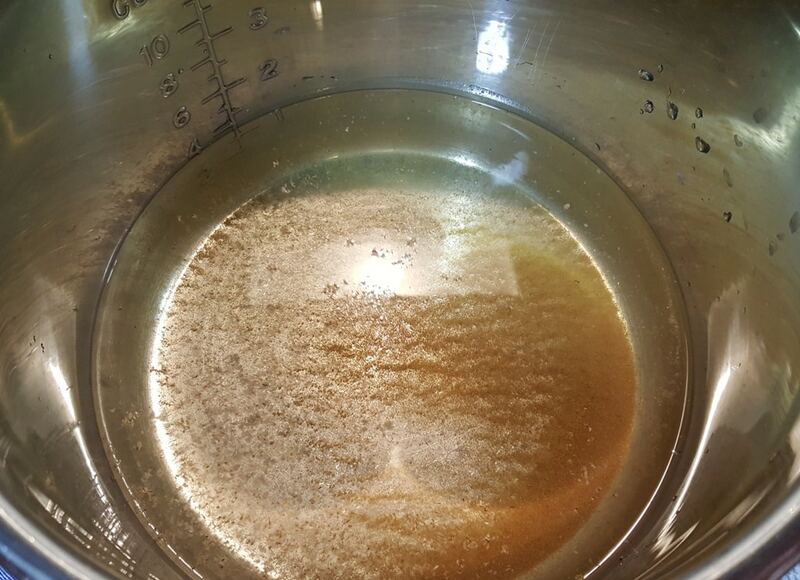 The vinegar and spices give the impression of old and “dirty” water. At least, that is what I think and by George, I am sticking to it!!!! Drop in your Hot Dogs and you are ready to cook. Oh, how I wish I had some Kayam Dogs in the casings….. 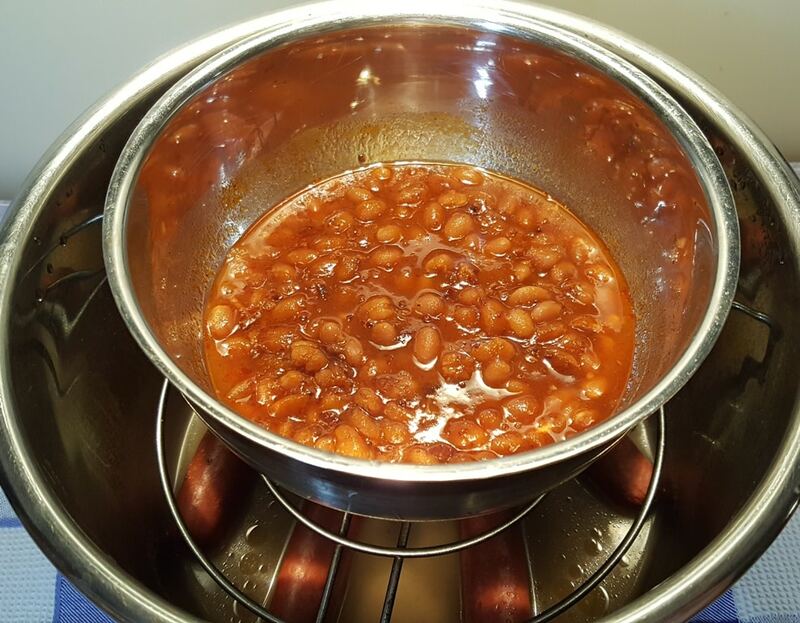 If you have some leftover Pressure Cooker Holiday Baked Beans, reheat them using the Pot in Pot Method. You do have some beans in your freezer, right? If not, make some Pressure Cooker Holiday Baked Beans, so you always have them on hand. The longer the Dogs, soak, the more flavor you will pick up. 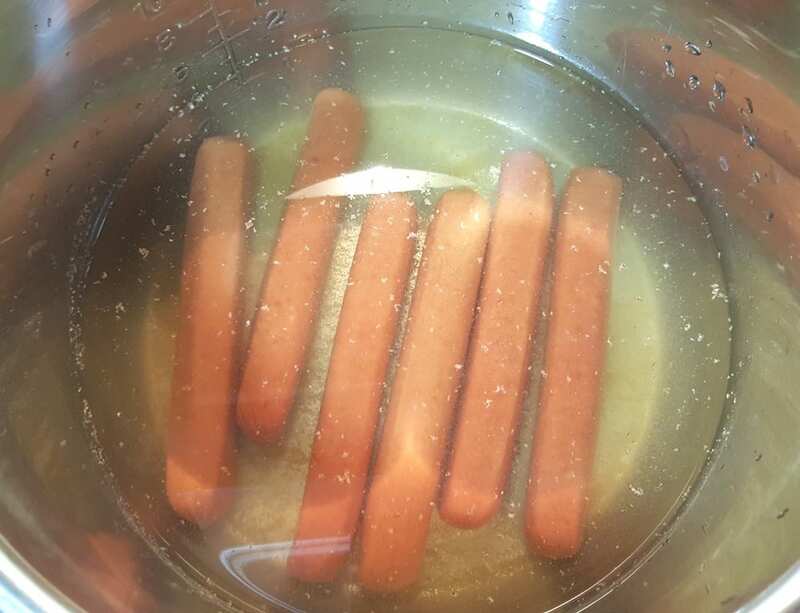 Place the Pressure Cooker Dirty Water Hotdogs onto the buns, allowing some of the “dirty water” to drain into the Hokkaido Hotdog Bun. I like a little brown mustard and hot dog relish and/or tomato onion relish (recipes coming soon). The hubs likes them with just brown mustard. Sometimes, I like them totally plain. I always like them with my Pressure Cooker Holiday Baked Beans. 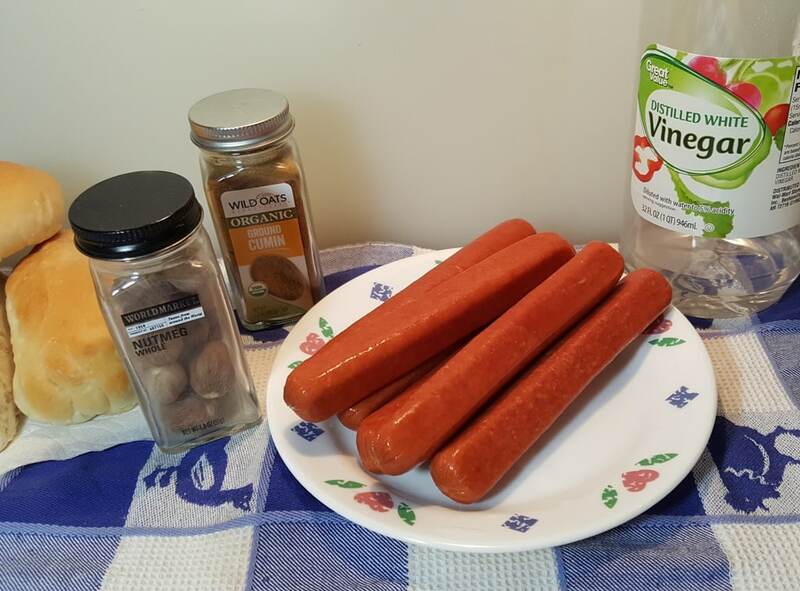 Don’t forget to check out my Hokkaido Hotdog Bun recipe. If you are a Yogurt Maker, you can use your whey, in place of the milk! 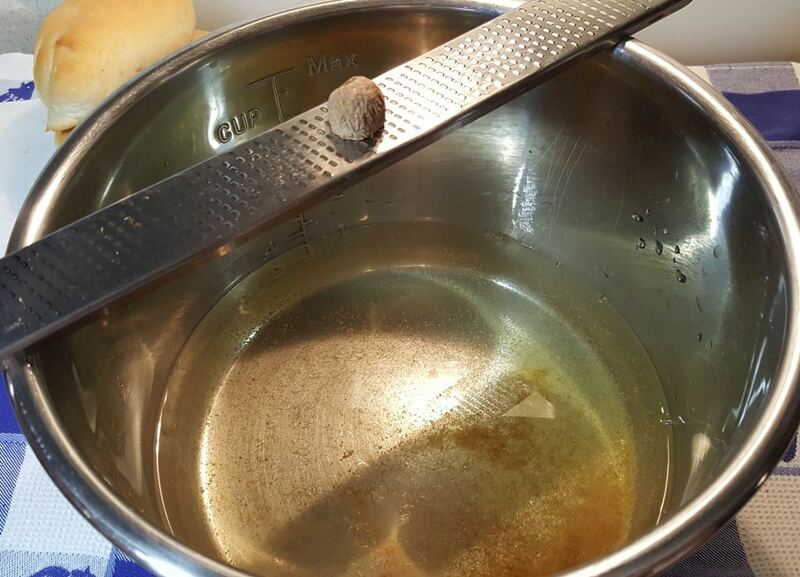 Add water Water, Vinegar, Cumin and Nutmeg to your Pressure Cooker cooking pot. Lock on the lid and close Pressure Valve. Cook on Low Pressure for 3 minutes. hen Beep is heard, allow a full Natural Pressure Release. Serve on Hotdog Buns, allowing some of the water to drain onto the bun. If using High pressure, cook for 2 minutes with full Natural Pressure Release. 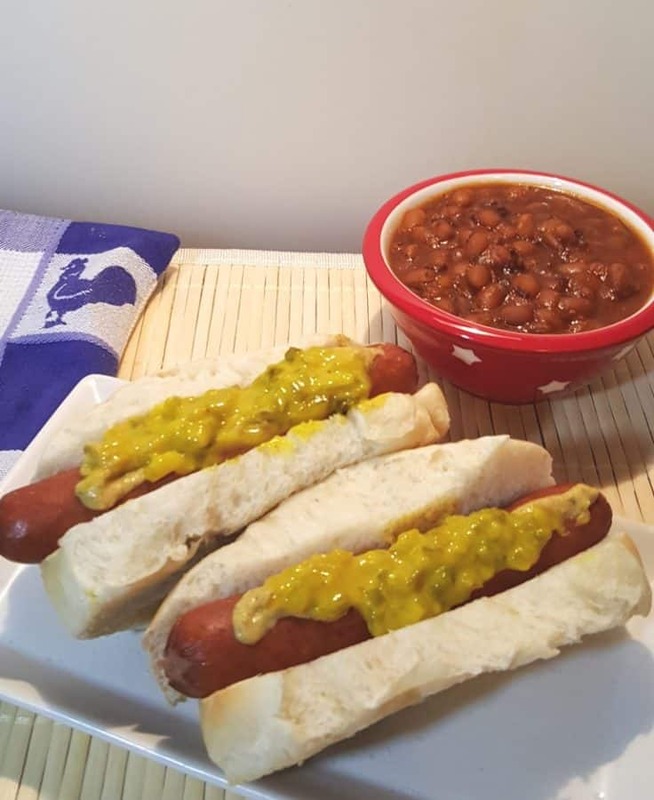 PIN this Instant Pot Pressure Cooker Dirty Water Hotdogs (New York Hot Dogs)! Yes, you need the casings!! Hard to find here in Houston. Boar’s Head does have them. The West Coast does not have any good hotdogs that I can find. I think that Trader Joe’s has hotdogs in casings. Don’t you have Ball Park? Hey Jill. This is good timing for m, to find this recipe that is. Next weekend I am in charge of cooking hot dogs for my church bazaar and we usually cook outside on the grill, but sometimes people don’t like it since there might be a black scorch mark or something. If everyone was as unobservant and evil may care as me there would be no axiom you in this world, but the reality is otherwise. Anyhoo, if I use the IP to cook the dogs that problem would go away. How many do you think I could cook at a time in my 8 quart IP? I’m thinking afterwards I could transfer them into a crock pot to keep the hot until served. Thanks Jill, after re reading my post I see the spell check had its way with me. Oh well. C’est la vie. (Sometimes, spell check is my enema.) whoops! Thanks for the response. 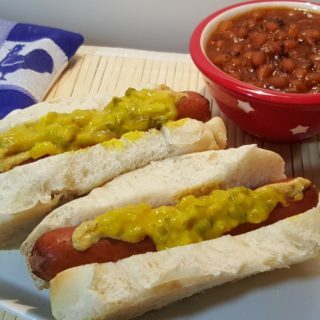 The recipe neglected to actually have the hit dogs added to the pot. How many hot dogs can actually be reasonably cooked in a 6 qt pot? As many as you can fit, with enough water to cover. Couldn’t help but grin at your comment about not wanting to know if the water had been changed! We used to try not to think about restroom/hand washing at some of the remote corner locations in parts of NJ. LOL Best not to think too much and just enjoy the yumminess! Okay I need help. We made this last night as a test run for a party Saturday where I plan to make a lot. I did the hot dogs on the bottom in the dirty water and the chili in a bowl on top of the steamer tray with frozen corn on the cob. I opened it up and everything was gorgeous. Corn was perfect and juicy, chili was hot but I removed the tray and oh no my hotdogs had exploded???? I used Ballpark all beef. Does this mean they were skinless? I didn’t think so. The last time we had a party I did them in my slow cooker so I may go that route but was trying something different. Thank goodness this was the trial run. Did you use low pressure? Never heard of Kayem Hot Dogs. They were sitting on the shelf and were on sale in my local Publix (Florida). I couldn’t upload a picture of them but I can’t wait to try this! My instant Pot is sizzling now! I have lived most of my life in NJ and grew up on dirty water dogs. The real ones, before the mayor made them get hygienic, changing the water and washing their hands… You state in the recipe if you double the dogs, double the spices. Makes sense. However, you also mention freezing the water to use next time. 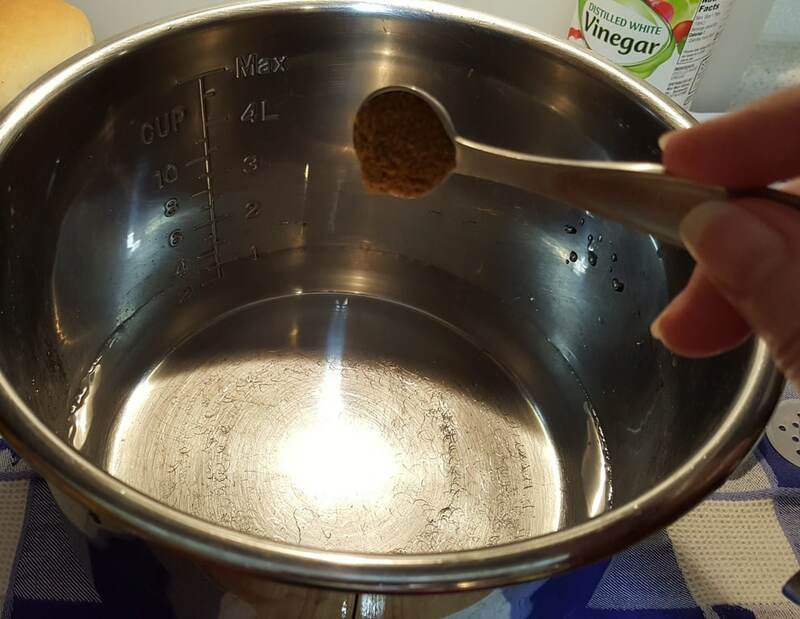 If you make a single batch, freeze the water and use to make a second batch, would you add the spices again? If I make a double batch, if the next batch is a single, will it be too much spices? Am I overthinking this? 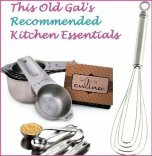 Love your website and recipes, thank you! You could always go to Pink’s Hotdogs in Hollywood and wait forever for a hot dog lol. I have a Lux… no low pressure. Should I use the stove or can it be done with high pressure? Steam? Also… what is a skinless hot dog? I wonder if we could cook sausages like this. Best hot dogs around are Sabrett’s if you can get em. Can’t wait to try this. You asked for other ideas for good brands of hot dogs. My husband adores hot dogs, and his favorite is Nathan’s all beef hour dogs. Be sure and get the short fat ones not the long skinny ones. Ralph’s carries the boarshead hotdogs in the deli section. They are delicious! What do you mean “hotdogs with casings”? You don’t mean the plasticy sort of wrapping some wei ers come with on them do you? Also, how many hotdogs could you cook at once ….. 25 or more? I’ve heard you can make Coney Island Hot dogs, by cooking them in ‘ketchup’ water…but neve heard of these previously. Hi. If I’m making the hotdogs without the dirty water. I assume that I don’t have to submerge them in water at all, right? I mean 1 cup of water, and then all the dogs on a rack should be ok, right? Also, I’m doing this ahead for a baseball tailgate with the intention of cooking ahead in the Instant Pot, then throw on the grill once I get to the tailgate to warm through and to get a char on them. If I keep the lid on after naturally releasing, the hot dogs should stay warm until it’s time to throw on the grill, right? Hi Que! I was wondering how this worked out for you? I would like to pre pressure cook my dogs and leave them in the pot. How long did they stay warm for you? How long would you say it takes for a full natural release? I found Kayems dogs at Walmart. Sabretts have always been my favorite because of their snap. Now im really anxious to try Kayem. Thanks. We never, ever, refer to them as “Dirty Water Hotdogs”. Only “Dirty Water Dogs”.